The Himalayan nation of Bhutan is the only country in the world where Archery is the national sport. Whilst there are no formal archery clubs in the country, archery is used as a social event, at which villages and amateur teams compete against one another on a regular basis. In 2016 HRH Prince William, Duke of Cambridge and Catherine, Duchess of Cambridge visited Bhutan on an official Royal Visit and were welcomed by Princess Ashi Chimi Yangzom Wangchuck, the Kings sister. During the two-day visit, they met the King and Queen of Bhutan, Jigme Khesar Namgel Wangchuck and Jetsun Pema, who are similar in age to the Duke and Duchess and are known as the ‘William and Kate of the Himalayas’. The Duke and Duchess won over the people of Bhutan by participating in an archery event, much to the delight of around 10,000 people who watched their efforts at shooting a traditional bamboo bow. The Kings and Princes of Bhutan have long mastered and encouraged the skill of archery and the sport has come to embody the sovereignty of the nation. Much like in England, archery has played an important role in ancient battles, and Bhutanese archers were key to defeating eight major Tibetan invasions. Bhutanese legend speaks of an Indian Prince, who 600 years before the Common Era, won the hand of the beautiful princess Yosodhara in an archery contest. Another story that links the country to archery is that of the well known ’Divine Mad Monk’ Drukpa Kuenlay, who found his destiny in Bhutan after he followed a divine vision asking him to shoot an arrow south from Tibet, following the arrow, he found Bhutan. In traditional archery, the targets are placed at a ‘long distance’ with archers going back and forth between two targets. Traditionally they shoot one pair of arrows each way, with a bamboo bow. 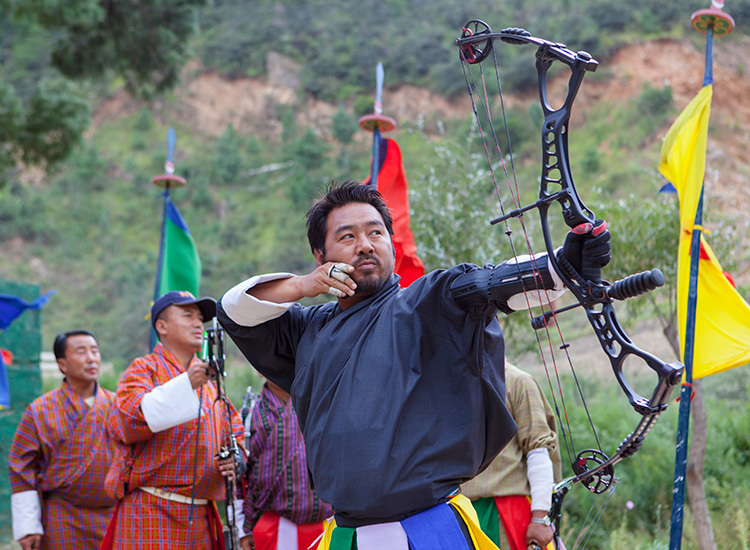 Most of the Bhutanese archers now shoot compound bows in ‘traditional style’ without sights or release aids. 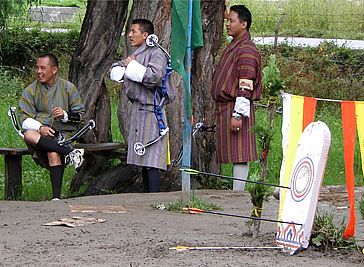 While recurve archery, in international format is left to a select few that are trained by the Bhutan Archery Federation. The Bhutan Archery Federation is located in Thimphu, the capital of the country, and have recently started a program to promote archery in schools, as well as the training of an international recurve archery team. The Himalayan nation organises training camps during school holidays to identify talented archers, the criteria for selection has nothing to do with scoring, but with the form of each archer. Over 1,100 archers participated in four camps, each held in a different region, that were organised to select the recurve team for the South Asian Games. 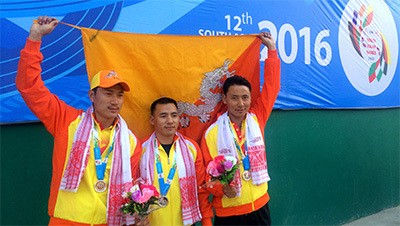 At the February 2016 South Asian Games, held in India, Bhutan collected one silver and four bronze medals. That silver medal came courtesy of Bhutan’s compound men’s team. Bhutan’s National Championship, the Yangphel Archery Tournament, is held on an archery pitch which is centuries old, normally just as the monsoon season ends. For more than 10 years now, archers in the tournament have been allowed to use compound bows in place of traditional bamboo ones. However, in a typically Bhutanese manner, modern sights and release aids are not allowed. Archers competing must wear traditional robes and knee-high socks, which whilst is not quite compliant with Archery GB Rule 307, is nevertheless an acknowledgement that the presentation of the sport and standards of dress are not just a British thing! Tournaments normally start at 8:00am and finish at 4:00pm, shooting in teams of six archers, typically with 15 rounds. Archers shoot two arrows each round at a small wooden target, set in the ground, around 150 yards away. Each time the target is struck the archers sing and dance, with songs about love, enlightenment and karma. The dance steps are a simple back-and-forth shuffle. Because compound bows are more accurate than bamboo ones, the frequency with which the targets are hit has increased as has the time required for the traditional celebrations, making the tournaments last even longer. Teasing and taunting of opponents is common, much like at many events in the England! It has been reported that historically one of the most common reasons for hospital admissions in Bhutan was due to archery injuries, possibly due to the fact that tournaments include drinking and celebrating. Archery and Buddhism have long been linked, and Buddhist fatalism may have played a role in tempting fate when archers would stand in front of the target and get shot rather than allow their opponents to win, something that is not practiced today with the use of compound bows.